Hi guys, I'm looking forward to talking about Tone. It's something that comes up quite often among my students and with fellow bass players. We're all searching for it... now how do we find it? What are the pickups you use? It’s basically everything other than how do you make your bass sound like that, which is the truth. I’m very lucky to use amazing bass gear that does elevate your sound but really, it’s only enhancing what’s already underneath as a fundamental. I suffered with my tone so bad during my Berklee days, to the point where I was told after gigs from friends that they couldn’t make out my notes and everything was muddy. During student studio projects, I would often find myself having to overdub phrases because of the open strings and fret buzz. I’ve learned over the years that playing music really is connected to your personality. When you’re not feeling confident you subconsciously hide with your tone or the opposite can happen where you just dominate the sonic energy with your noise. My problem is, by nature or by conditioning, I suffer from insecurity in a lot of ways. I’m quiet and shy and quite often when I was growing up I was told to speak up and to stop mumbling. I’ve become so comfortable in my own world practicing bass day and night that I’ve gotten to the point where my instrument and tone have become an extension of my reality, good or bad. They say music doesn’t lie and with no doubt that’s the truth. It was this realization that made me focus on music and life, generally in a more productive and positive way. I need to take pride in my voice and it’s important that I can overcome these fears. How did I change my tone? I believe there is more focus from the student on harmonic concepts, which is then followed by rhythm and time. Everyone seems to want to be able to play the stuff that we perceive to be impressive to others. We don't put enough into learning how to develop our tone and then rely on the belief that better equipment will be the solution. The only problem is when you do get the high end gear, you still have the same issues. I started getting good results when I slowed everything down and became mindful of everything I do. For me it’s like training to box or do martial arts. If you watch a great champion boxer train they are not just hitting the pads or the bag as hard as possible, they are tapping and being mindful of their form and technique, understanding their range and coordination. The art of Tai Chi is a great example. It’s all about control, mindfulness, form and intention. Every action has a reaction so we must become aware and mindful of our instrument. Here are some questions you can ask yourself about your bass. How do the frets feel? Do they stick out? Are they all even across the fretboard? Where do you rest your thumb on the right hand as you are striking the strings? How’s your action? High, low, or in the middle? Do you use a strap? When you sit down to practice do you use the strap? Does it hang on your body the same way or does it rest on your knee? When you sit down how’s your posture? Does the bass rest on the right leg or the left leg? Do you feel relaxed and comfortable playing all the notes across the entire range of the bass? Do you find your body position changing to play some areas of the instrument? Do your strings feel sticky a little or are they smooth? Do you like new strings or slightly older ones? How are your tone settings on the bass? Do you have to play lighter when playing over the front pickup? 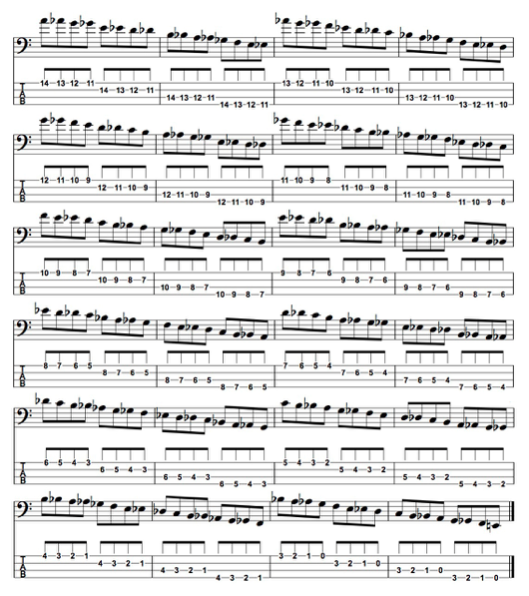 Do you use the fingertips on the left hand as you strike down on the fretboard? How much pressure do you apply with your thumb on your left hand on the back of the neck? Do you release your fingers on the fretboard quickly with the left hand? How are you striking the strings with you right hand? Which part of the finger connects with the string? Do the same notes sound better on different strings? Do your fingers become fatigued and if so in what way? Do you even know or think about what tone you want? As you can see there are a lot of questions above, some we may have been aware of and some we may just take for granted. Everything in life is cause and effect, so it must be true that every detail of how you play and touch your instrument must have a resulting affect. It’s not a coincidence that we’re able to recognize Herbie Hancock over Chick Corea almost instantly, even if they are playing the same chord or when they’ve played duo concerts. That’s why Jaco sounds different than Marcus Miller. All the masters have a very distinctive voice on their instrument beyond effects and gadgets. They know their instruments like a blind person would. I would actually sit and imagine the tone I wanted on my bass and really understand and become aware of and familiar with it. I believe if you can envision something you can make it a reality. You have to know what you want to obtain. By transcribing and playing back the lines, along with records, with the volume turned down on the bass, it can really help you gain more control of your sound. If you really tap into the sound of the bass you are trying to mimic, you will naturally get closer to it. I always warm up every day before I practice with the same 5 simple exercises, which are variations of one another. 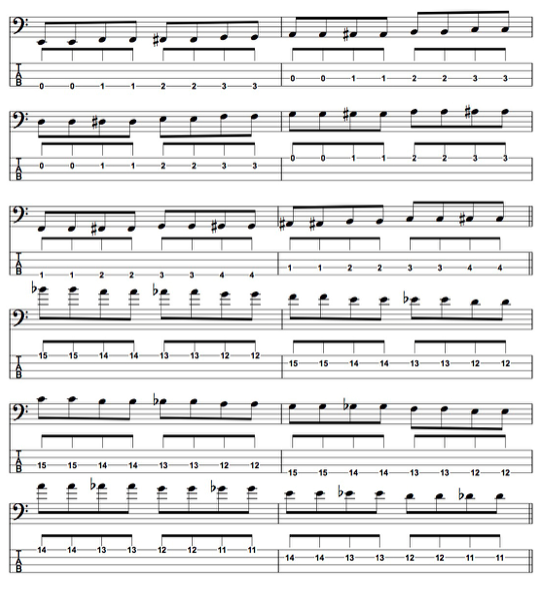 I practice these exercises without a metronome and really play them slowly. I’m envisioning the tone I want as I’m playing them. 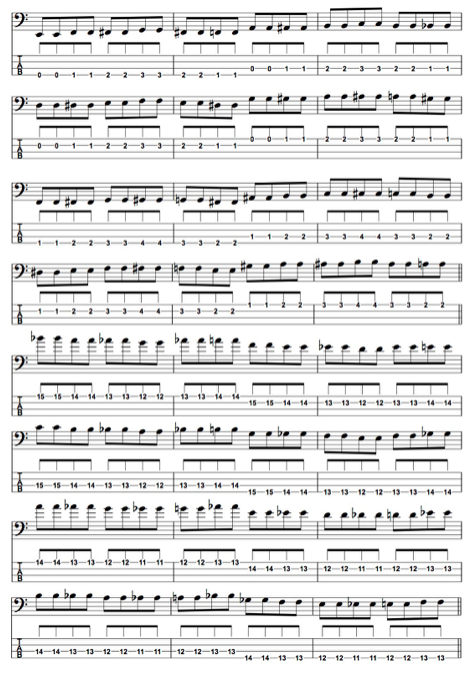 Below the lesson video are the exercises, written in notation and tablature for the 4-string bass. 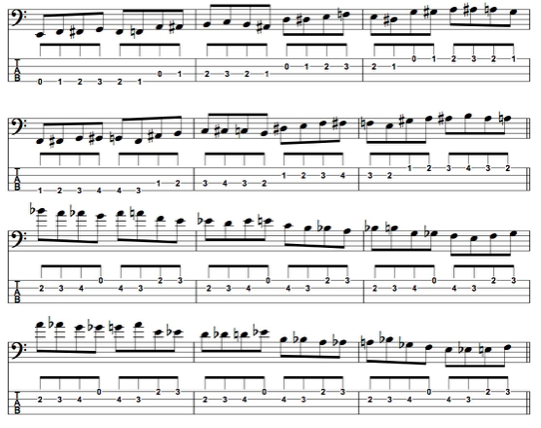 These exercises are easily transferable to a 5 or 6 string bass and beyond. They are not designed to give you great chops, but they are designed to help you with your form and articulation. In the lesson video I'll demonstrate how I connect with and play my instrument, in an effort to create my own voice. Check it out! With any exercise make sure you are relaxed. You can play with intensity just be mindful you are not hunched over in a restricting way. If you feel tension or pain, stop and assess how you're playing your instrument. All notes should be comfortable to play and not require you to move around a lot. Everyday before I start practicing I pick up my bass at a low volume and play through 4 simple warm up exercises. I have written out Exercise 1 in full so you get the full picture, but for Examples 2-4 they are just the first few bars ascending, and a few descending, to just demonstrate the pattern. Remember this is your time to really refine your sound and the way you approach your instrument so remain mindful of how you get through these exercises. In the video demonstration you can see clearly how my posture is, how I’m striking the strings with the right hand and how much pressure I apply with the left hand on the fretboard and behind the fretboard. For each of these exercises I alternate with the 1st and 2nd fingers on the right hand, which may be a challenge for some of you at first. Even if it seems simple, if you pay attention, you may catch yourself doubling up with each finger, etc. Many of us struggle with breaking old habits which is normal. It's a practice, which requires awareness and consistent effort. I used to play with the raking technique religiously as it’s really natural way of playing the bass and lends itself very well to creating great bass lines. First, I’m showing you how I strike the E String with both index and middle fingers. You will notice my thumb is resting on the ramp, if you don’t have a ramp the pick up is another option. When playing on the low strings you should try muting the open strings with parts of the left hand. When you are playing notes on the E String, your left hand naturally covers the other strings below it. If you are consciously aware of muting the strings then it will happen more naturally. Next, I’m showing you how I strike the A String with both index and middle fingers. You will notice my thumb is resting on the string above, which in this case is the E String. This time I'm muting the other open strings again with a combination of both hands. Generally I mute the higher strings with my fretting hand (Left) and the lower strings with my Right. Next I’m showing you how I strike the D String with both index and middle fingers. You will notice this time my thumb is resting on the A String. Again, I'm muting the other open strings with a combination of both hands, the higher strings with my fretting hand (Left) and the lower strings with my Right. Next, I’m showing you how I strike the G String with both index and middle fingers. You will notice this time my thumb is resting on the D String. This time I'm muting the other open strings with only the right hand. The thumb rests across all the other strings. This probably all sounds a lot more complicated and involved then it actually is. It really is quite simple and will become second nature to you as you practice and apply it. Try to keep your notes even and dynamically the same velocity. Work your way slowly up the the 12th and descend back down to the open string and continue without stopping. Take a short break between exercises. Exercise 2 is a variation of Exercise 1 with the only difference being the notes are doubled. This is a common technique used when grooving so it makes sense that this motion if comfortable and fluid. Exercise 3 is a chromatic pattern that ascends and descends. It is a 6 note pattern so if you are tapping some sort of time with your leg or a metronome, notice that every other pattern will land on the click itself. When I was becoming really conscious of my technique I was aware that my technique was a little clumsy when playing and wanted to change direction. 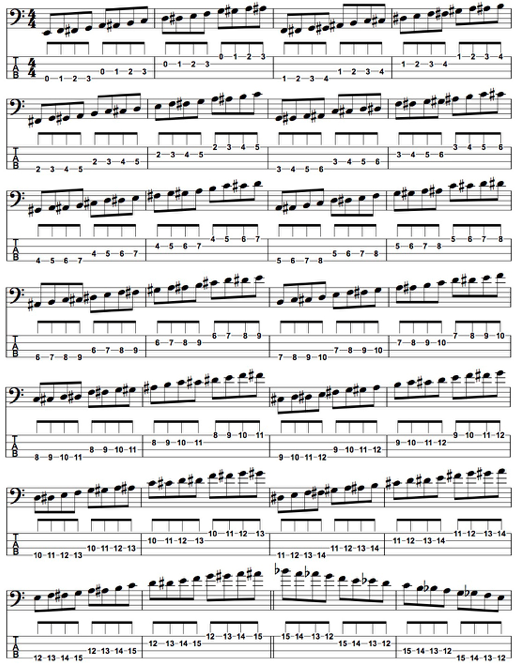 Exercise 4 is a variation of Exercise 3 with the only difference being the notes are doubled up. This exercise is a little longer to get through. And each day you can change the order you play through these.